When I was conducting field interviews about dam displacement in rural Ethiopia in 2012 I stumbled across a community activity I did not expect to find: panning for gold in the Nile River. Artisanal Small-Scale Gold Mining (ASGM) supported the otherwise subsistence lifestyle of the Gumuz People (an ethnic minority of about 200,000) providing cash for school fees, fish nets, salt, and plastic shoes. 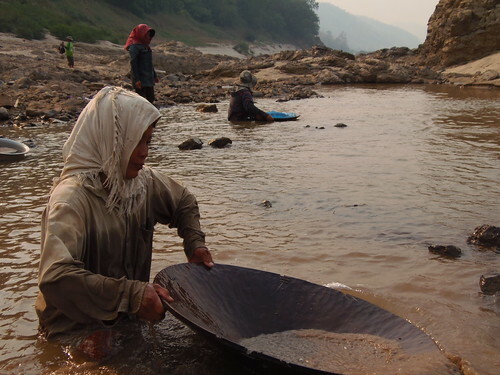 A few months later doing similar field interviews in rural Laos in 2013, I found that the subsistence communities there were also panning for gold—this time in the Mekong River. 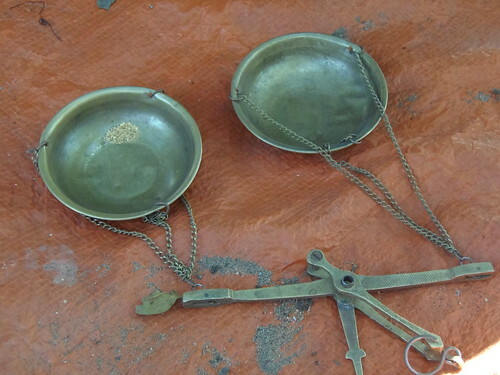 Knowing these communities had no chance for contact – both living relatively off-grid and on separate continents – I wondered: How common is gold panning in the modern world? In short—very common. You don’t need much, and rewards can be significant for those willing to put the time in. And the people doing the panning are unlikely to be aware of the impacts to their health. The implements for ASGM that I saw in the field are similar what you see in photographs of 49ers in the Western USA during the historic gold rush in the 1840s that famously brought people to California. They use a simple bowl for capturing and sifting silt, and another simple container to hold the gold once it is separated from the silt. Today in Oregon, where I live, you can purchase gold panning equipment in a convenience store, alongside potato chips. The implements are usually made of plastic and contain a metal screen for sifting out nuggets. That’s pretty much it. Except in most places, gold isn’t found in nuggets, it’s collected in tiny quantities—flakes, even. And to get at it you need more than plastic bowls with a metal screen. You need mercury. If it was just pulling gold nuggets from stream beds, collecting them and selling them to a local dealer for a good price, gold panning could be seen as an overall positive—but the mercury changes the story completely. Mercury is a heavy metal that causes significant neurotoxic effects in humans—in the late 1800s the metal was used in the creation of fancy hats—hence the moniker “Mad Hatter” since so many of those who made hats went temporarily crazy from exposure to the stuff. In fact, Danbury, Connecticut, once known as the Hat City of the World is where I was born. Though the hat factories went out by the 1950s, the town is still host to mercury-contaminated sites. According to the National Institutes of Health, and World Health Organization “there is no known safe level of exposure” for mercury. Long-term exposure can lead to permanent disabilities, and fetuses are especially at risk: mercury exposure in utero can mean lifelong mental impairment (this is the reason pregnant women in the US are advised to avoid certain types of tuna, swordfish and kingfish—it’s because top-of-foodchain fish store—bioaccumulate—mercury in their bodies and if you eat them, it gets stored in your own body). And kids are less able to process toxic heavy metals—including mercury—due to their smaller body size. Since mercury bioaccumulates, it can have health repercussions for years post-exposure. Yet, as you can see from these images, women and children are often those doing this work. Why mercury? It’s used to fix gold particles from river sediment – the mercury is added to sifted material, adheres the gold but not the other sediment, and then is later burned off to isolate the gold. This is how very poor people can extract very small amounts of gold from their local rivers and streams. 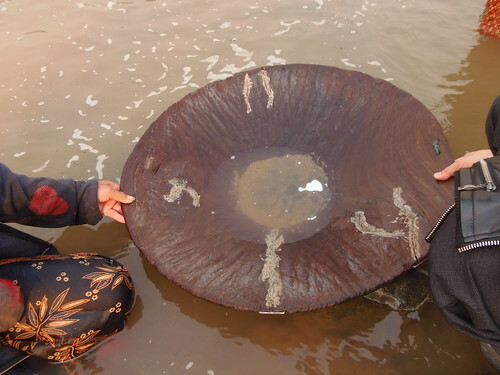 I saw mercury used in Laos, in the Mekong River. This is the practice most commonly used by panners from the Amazon to the Niger when gold is found in the form of dust or flakes in river silt or other sediment. 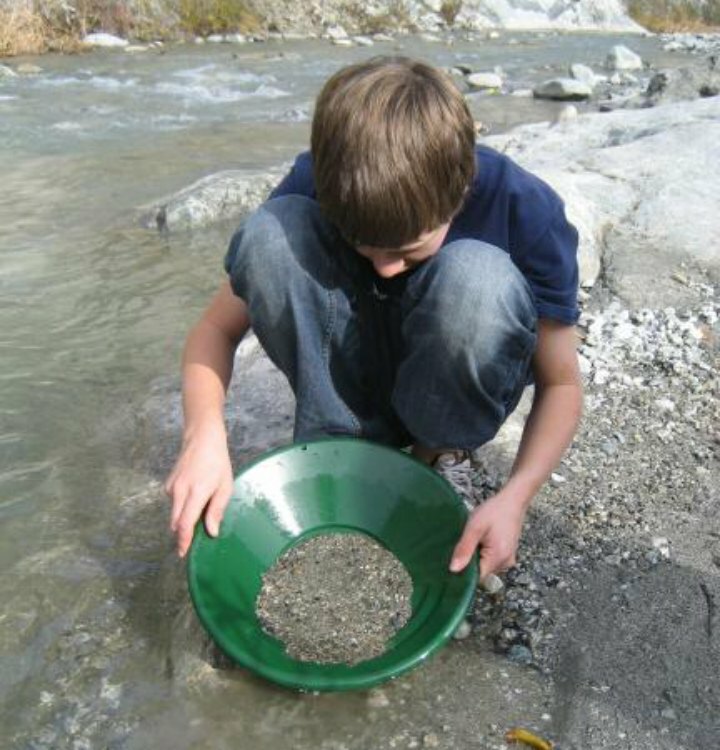 Gold panning is on the rise in many countries throughout the world, accounting for from anywhere between 12 to 20% of the gold that goes to market. A scientific paper released in 2013 by Viega et. al in the Journal of Cleaner Production estimates 100 million people in 50 countries depend on ASGM for some portion of their livelihood. And those incredible prices for gold you have been hearing about? That’s impacted how many people worldwide are engaging in this dangerous enterprise. In 2005 gold was $400 per ounce, but by 2010 it had almost tripled in price to $1,100 per ounce. This increase in the price of gold occurred at the same time as an increase in rural poverty and the 2008 global economic crash. Put those factors together, and you’ve got a recipe for increasing numbers of desperate people looking for even small amounts of gold. In a 2013 report by the United Nations Environmental Program on global mercury pollution, the highest intentional use of mercury that contaminates oceans—almost 20%—originates because of gold mining. (An unintentional contribution is mercury emitted by coal-burning power plants; it’s this mercury that gets into the fish women are advised not to eat). So the two largest sources of mercury in our waterways are via power plants and from gold extraction. No mention is made in the report about the effects of handling mercury or inhaling mercury, both types of exposure most certainly happening in different stages of ASGM. Where does this toxic substance come from in the first place? The 2013 Viega paper points the finger at not only historically low relative prices of mercury, but an illegal trade in mercury that originates in the European Union and ends in developing nations from China to Brazil. 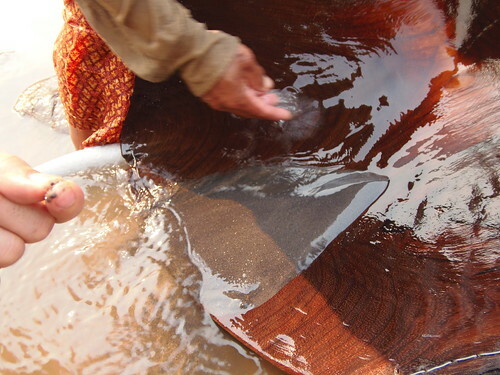 There are some alternatives to using mercury in gold mining. The EPA has developed a system that captures the mercury when it is vaporized in the burn-off stage. However, many people using this method are in remote locations and are impoverished. Other solutions are needed. A friend of mine turned me onto a report that claims corn starch can extract gold from discarded electronics. Perhaps environmentally benign material like corn starch could replace mercury. Since the practice of ASGM is on the rise, as is mercury contamination of our air, land, and waters for a variety of reasons, so should research for alternatives and outreach solutions increase. These gold panning communities are in a position to reduce mercury contamination, not only to the environment, but to themselves—and because water resources are always shared—all of us. For more information on artisanal gold mining, you can watch an EPA video that includes information on their capturing system. For more information on gold in general, you can watch the History Channel’s “How the Earth Was Made” episode on gold. Do You Share Genes with Friends? It’s Likely.